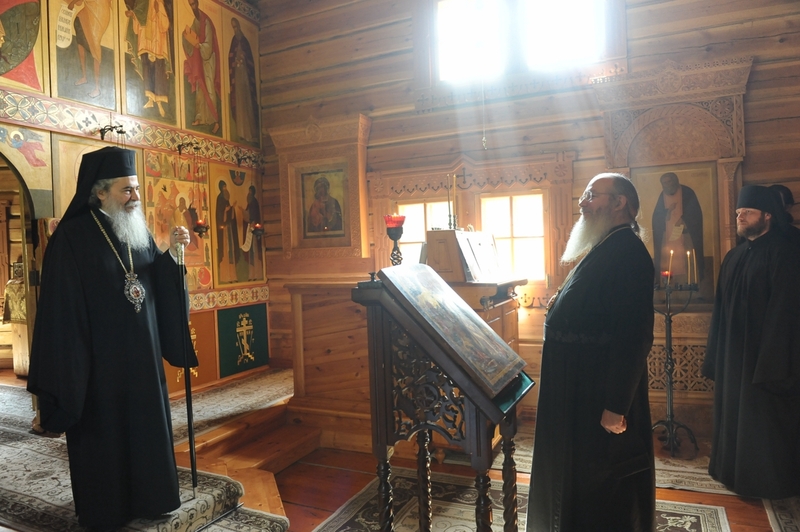 On 29 May 2013, His Beatitude Patriarch Theophilos III of Jerusalem, currently on official visit to the Russian Orthodox Church, went to St. Elijah’s scete of the stavropegic Monastery of the Transfiguration on the Valaam Island. The delegation, accompanying the Primate of the Church of Jerusalem, consists of Metropolitan Kyriakos of Nazareth; Archbishop Aristarchos of Konstantina, secretary general of the Holy and Sacred Synod of the Orthodox Church of Jerusalem; Archbishop Theophylactos of Jordan, Patriarchal Commissioner to Bethlehem; archimandrite Stephanos (Dispirakis), representative of the Patriarch of Jerusalem and All Palestine to the Moscow Patriarchate; archimandrite Galaktionos, hegumen of the monastery in Ramallah; and hierodeacon Athanasios (Themistokleos). Accompanying His Beatitude on behalf of the Russian Orthodox Church were Bishop Pankratiy of Troitsk; abbot of the Valaam Monastery of the Transfiguration; Bishop Tikhon of Podolsk; chairman of the Moscow Patriarchate’s Finance and Economic Administration; archimandrite Isidor (Minayev), head of the Russian Ecclesiastical Mission in Jerusalem; and staff members of the DECR, hieromonk Stefan (Igumnov) and Anatoly Churiakov. Hierodeacon Iliya and the brethren met the guests at the wharf. The Primate of the Orthodox Church of Jerusalem visited St. Elijah’s church. Members of the delegation sang the praises to the Holy Prophet Elijah and lit candles. In his address to Bishop Pankraty, His Beatitude said inter alia that servants of the Church had a great mission to fulfill and expressed his appreciation of the leaders of the Russian Orthodox Church who care for monastic centers which are the sources of life. Our Saviour said: ‘Let anyone who is thirsty come to me’ (Jn 7:37). He considered the Church as the source, and the Holy Spirit, who makes this source even stronger, is the water flowing into eternal life. Patriarch Theophilos thanked the monks for their love in Christ and expressed his wish for all, including the great country of Russia, to be filled with the grace of the Holy Spirit. Then the delegation went to the Svetly Island by motor boats. The choir of the Valaam metochion in St. Petersburg sang festive hymns for the guests. The Primate of the Orthodox Church of Jerusalem thanked Bishop Pankraty for hospitality and spoke about the situation in the Middle East, reminding those present of the difference between a terrorist martyr who is a devil’s witness, and church martyrs who suffer martyrdom for the love of Christ. After lunch, His Beatitude Patriarch Theophilos and his suite departed for St. Petersburg by helicopter. St. Elijah’s scete is located ten kilometers to north-east of the monastery, on a small Lembos island. The pre-revolutionary buildings, including the church, have not been preserved. In 2006, monks and benefactors helped to rebuild the church in traditional architectural style of Northern Russia; the carved memorial cross was erected on the high bank.